Dyno Run of the Lethal Performance 2011 Mustang GT w/2.9L Whipple Crusher Kit! Here's a dyno run of the Lethal Performance 2011 5.0L Mustang GT with the first Whipple 2.9L Crusher kit. The run was done at STP Motorsports in Ft. Lauderdale FL on their Dynojet. The blower was making 10psi using a 4" pulley. The exhaust consists of the Lethal Performance 3" Offroad X-pipe and the Magnaflow 3" Competition catback. All of the tuning was done by Jon Lund of Lund Racing who does all of our custom tuning. We'll be headed to the track tomorrow night to see how she runs. Whipple time for the Lethal Performance 2011 5.0L Mustang GT!! Our 624hp kit just arrived!! I'll be posting pics in just a few. Working on them now. Whipple/FRPP 5.0L GT Supercharger Kits Shipping Next Week!! Lethal Performance is proud to announce that we're now taking orders for the Whipple/FRPP 2.3L Intercooled Supercharger Kits for the 2011 5.0L Mustang GT. These kits will start shipping next week. There's a few ways to purchase the kit. All of which are listed on our site and can be seen by following the link below. The complete kits come with everything you need to install and drive and comes in both 525hp and 624hp versions. If you have any questions about these kits or would like to place an order for one please feel free to give us a call and we'll do our best to help you out. 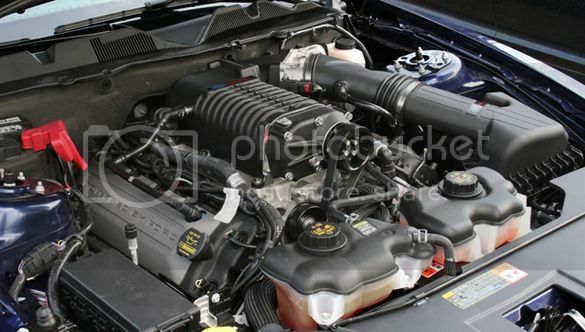 More 2011 5.0L GT Whipple Supercharger EXCLUSIVE info! We're getting real close to having the new Whipple kits for the 2011 5.0L Mustang GT start shipping. I'm being told it can be as early as next week. We've already listed both the complete and tuner kits on our site. More options, info as well as pricing will released shortly. In addition to that we've learned that the Whipple kit for the 2011 GT will use the stock 07-11 GT500 throttle body. That's good news as the stock single blade throttle body on the 2011 GT would definitely appear to be a restriction on boosted applications that love to flow lots of air. What this also means is that you'll be able to upgrade to even larger throttle bodies such as the Whipple monoblade and Super monoblade throttle bodies as well as L&M 66/72mm ones and the VMP 67/72mm ones. Without a doubt we know how much of an improvement those throttle bodies have done in the GT500 community and we feel very comfortable saying that they'll do the same for the 2011 5.0L GT community. For now stay tuned as we'll be releasing more exclusive content as it comes in. Here's a clip we made of the Lethal Performance 2011 5.0L mustang gt so everyone can hear how amazing the new exhaust setup we put on the car sounds. The combination is simple, makes great power and sounds incredible. We started with our 3" mandrel bent offroad x-pipe and topped off the back half of the system with the Magnaflow 3" Competition Catback w/ Magnapack mufflers. The fit and finish of both of these products is top notch. No cutting or welding required. It all bolts right in and comes with all of the hardware needed. When you start the car you right away notice the awesome muscle car sound. Once the car comes down to idle it actually has a slight lope to it which is most like more related to tuning of the ti-vct but is much easier heard with the less restrictive aftermarket exhaust.. As you drive away the tone is deep and throaty but not raspy. From inside the car you really feel like this is how the car should have come from the factory. Cruising along there's no drone at any speed or rpm up to 110mph. Not sure after that as that's as fast as I attempted to test the car on the highway. Under full throttle the same thing applies. A loud throaty american muscle sound without any rasp. For those who are concerned about noise level inside the car you can still listen to the radio and talk on the phone without being overrun by the sound of the exhaust. With that said I'm going to make my vote and say this is probably the best sounding exhaust setup for the new 2011 5.0L with the stock header manifolds. I highly recommend all of Magnaflow's products as well as they are made from T304 stainless steel, have awesome fitment and come with a limited lifetime warranty. If you have any other questions regarding our 3" offroad x-pipe or the magnaflow 3" catback please feel free to give us a call. Here's a video of the Lethal Performance 2011 5.0L Mustang Gt at the track last night. This was our first run off the trailer as well as our first run with the 93 octane Jon Lund tune, Lethal Performance 3" Offroad X-pipe and Mickey Thompson ET Drags. Our driver Derek Perez launched the car at 4000rpms to see how the car would launch. That RPM yielded us a 1.76 60ft. Although not the greatest 60ft it was a great starting point. This was done with the stock suspension, catback and exhaust manifolds. This run yielded us a 12.35@111mph. Later that evening Derek launched the car at 5000rpms and cut a nice 1.69 60ft which would have yielded a nice low 12 or high 11 ET however in between the 2-3 shift we experienced the "clutch issue" that we have been hearing about so much recently. What happens is that in between the shift the clutch pedal actually sticks to the floor. He was able to easily hit 3rd gear however with the clutch pedal stuck to the floor it won't re-engage the clutch and the car will then hit the rev limiter. We tried another 2 passes after the car cooled down only to be greeted with the same clutch pedal issue. From what we hear there is a TSB out on the new 2011 clutch which involves the clutch box assembly that's the cause of the pedal sticking to the floor. In the meantime while that's being worked out we're working with one of our clutch manufacturers to come up with an aftermarket clutch which not only drives like stock but will handle hp levels up to 1000hp. We'll make sure to keep everyone posted as we get more info. Here's a short clip of the Lethal Performance 2011 5.0L on the dyno at UPR Products in Lake Worth, FL. For this run the car had the stock tune and a Lethal Performance 3" Offroad X-pipe. Everything else on the car is completely stock. As far as dyno numbers go we're unable to advertise them as that info will be released in an up and coming 5.0 Mustang Magazine article compliments of editor Steve Turner. We are however able to release information about the gains we got with the 3" offroad pipe over the stock one. On a completely stock 5.0L we picked up 14rwp with the addition of the 3" offroad pipe only. This is on the stock tune with the stock manifolds and stock catback. All we did was remove the stock catted H-pipe and put on the Lethal Performance 3" mandrel bent x-pipe and a 14rwhp gain was achieved. The offroad x-pipes go for $299.00 and will be shipping the first week of July. Our 3" offroad x-pipe is mandrel bent and is a simple bolt-on modification. No cutting or welding is required. Installation should take less than an hour. You can order them by either calling us over the phone or by placing the order online. Either way we'll be glad to assist you. Looking to add horsepower and torque to your 2011 5.0L Mustang GT? Want a little more aggressive sounding exhaust? Well we've got the answer for you. It's the Lethal Performance 3" mandrel bent offroad x-pipe specifically made for the all new 2011 5.0L mustang GT. Here's a few short sound clips of how the offroad pipe sounds on our completely stock 2011. The installation takes less than an hour and the pipe fits perfect. No cutting or welding is required. We haven't dyno tested the car yet but we expect to do that in the next day or 2. If our pipe performs anything like our GT500 offroad pipe does than you can expect a 15rwhp increase over stock. Tuning is highly recommended to not only prevent check engine lights but to get the full benefit that the offroad pipe has to offer. We'll soon be offering a power package with this pipe and a Lund Racing custom tuned SCT xcal 3. For now enjoy the sound clips and please feel free to give us a call if you have any questions. You can also visit us 24/7 on our website www.lethalperformance.com. Just wanted to give everyone a first look at the new fuel system being used on the 2011 5.0L GT. We did this late in the day today so I'll have more pictures and info for you guys tomorrow. Of course we'll be working with our good friends at Fore Precision Works to design dual and triple pump return style systems capable of handling more power than the stock system will be capable of. These cars are going to need it as once the Whipple's and custom turbo setups start rolling out these cars are going to be making some sick power. I finally received the correct LED bulb for the 05+ license plate replacements. They fit and work perfect. On our car there's no glow at all meaning that they will not require a resistor. I'm not sure if that's going to be the same for all model years and options as we've got the HID and I'm unsure if stuff like that effects the licence plate bulb wiring or not. None the less here's a step by step installation and some comparison pics. We'll have plenty of the license plate bulbs in stock by July 1st. Using a phillips head screw driver remove the left side license plate bulb housing. Remove the stock bulb from the housing and replace it with the LED bulb. Make sure to aim the LED portion of the bulb downward in the housing and the white part of the bulb up. This will ensure that the LED when lit will shine down on the plate. Place the bulb housing back into the bumper and tighten both screws so that they are snug. Do not overtighten them as you can crack the bulb housing if they're tightened to much. Repeat the same procedure for the other side and your done.